A test fire of SpaceX's newest engine reached the power level necessary for the company's next round of rocket designs, CEO Elon Musk said on Twitter. 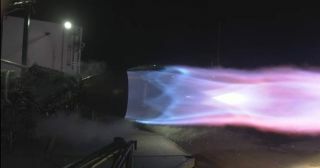 "Raptor just achieved power level needed for Starship & Super Heavy," he tweeted on Feb. 7, four days after he shared a photograph of the first test of a flight-ready engine. Eventually, SpaceX plans to assemble 31 Raptor engines into the Super Heavy rockets, with another seven Raptors on the Starship itself. The engines are fueled by a mix of liquid methane and liquid oxygen and are about twice as powerful as those aboard the Merlin engines currently flying in the company's Falcon 9 and Falcon Heavy engines.